We use the finest quality oils, unrefined nut butters, botanicals and natural clays along with our creamy goat milk in our handmade soaps. We use no preservatives, whiteners, artificial colorants, or hardeners. Our soaps all include grapefruit seed extract which is a potent antioxidant that not only extends our soap's shelf life but also has wonderful benefits for your skin. Our body butters, scrubs, bath salts, and lip balms are also natural with the finest quality ingredients. For more information about the ingredients we use in all of our products and the benefits of each, check this page out: Ingredient Information. Rose Quartz: A bright, fresh scent with notes of bergamot, orange zest, grapefruit, dried rose petals and jasmine, and a soft hint of sandalwood and musk. Made with coconut oil, sustainable palm oil, olive oil, goat milk, naturally saponified fats, fragrance, and grapefruit seed extract. Also contains Brazilian clay which helps improve circulation, gently exfoliates, cleanses, detoxifies, and minimizes pores, without drying the skin. This soap is luxuriously creamy and leaves skin feeling so pampered and smelling delicious! Everlasting Sunshine: An energizing blend of citrus, including grapefruit, lemon and lime, hints of fresh cucumber and jasmine, and a touch of pineapple, blackberry and champagne. In addition to the fragrance, it contains coconut oil, sustainable palm oil, olive oil, goat milk, naturally saponified fats, and grapefruit seed extract. This is a wonderful, moisturizing soap that just pampers the skin! Blackberry Sage: Creamy goat milk soap with a juicy blackberry fragrance tempered with sage featuring lovely natural color using French Green clay and Indigo powder which also add wonderful benefits for your skin. French Green clay gently exfoliates, cleanses, detoxifies, minimizes pores, clarifies, and heals the skin. Indigo has been used to treat inflammatory skin disorders such as psoriasis. It has anti-inflammatory, antibacterial, and anti-fungal effects on skin. In addition to the fragrance, clay, and indigo, this soap also contains coconut oil, sustainable palm oil, olive oil, naturally saponified fats, and grapefruit seed extract. Hawaiian Sunrise: A stimulating blend of plumeria flowers and citrus, including grapefruit, lemon and lime, hints of fresh cucumber and jasmine, and a touch of pineapple, blackberry and champagne. Brazilian clay is swirled into this wonderful soap which helps improve circulation, gently exfoliates, cleanses, detoxifies, and minimizes pores, without drying the skin. In addition to the clay and fragrance, this soap also contains coconut oil, sustainable palm oil, olive oil, goat milk, naturally saponified fats, and grapefruit seed extract. This is a wonderful soap with a rich, conditioning lather and a lusciously delicious scent that immediately takes you on a mental vacation to Hawaii! Honey Oatmeal: 100% natural and fragrance-free made with olive oil, coconut oil, sustainable palm oil, goat milk, natural saponified fats, ground oatmeal, local raw honey, and grapefruit seed extract. This soap has a creamy, luxurious lather that moisturizes as the oatmeal gently exfoliates. Honey is full of vitamins that nourish your skin and also has anti-bacterial properties and the goat milk gently dissolves dead skin cells. It is a wonderful all-purpose, creamy soap that is great for people with skin sensitivities and/or conditions! Luxury Facial: This 100% natural soap can be used on more than your face but I specially formulated it as a facial soap for oily or combination type skin but it has such luxurious moisturizers in it that it can also be used on dry skin. I could write a full webpage just on the wonderful ingredients in this soap but I will keep it short. Luxury Facial is made with goat's milk, aloe vera liquid, coconut oil, olive oil, avocado oil, cocoa butter, castor oil, and rice bran oil to provide luxurious moisturizers, and vitamin E-rich grape seed oil that lends it's astringent and anti-aging properties and lovely lather. Along with the wonderful creamy milk, butters and oils it also contains local raw honey which is naturally antibacterial so it's great for acne treatment and prevention. Honey is full of antioxidants which is a great anti-aging ingredient and it gives your complexion a glowing boost with it's soothing moisturizing properties. Honey is also clarifying because it opens up and unclogs pores. I added French Green Clay which has enormous absorbent powers, it literally 'drinks' oils, toxicities, and impurities from your skin and tones your skin by bringing fresh blood to damaged skin cells, revitalizing the complexion, and tightening pores. French Green Clay is marvelous for helping to clear problem skin. Sounds awesome, right? But I didn't stop there...I also added Turmeric which is a wonderful anti-inflammatory and has antiseptic properties and it also reduces oil secretion by sebaceous glands so is wonderful for acne-prone skin. Turmeric even reduces the appearance of scars and stretch marks! Activated charcoal was added to provide extra anti-toxin properties. Activated charcoal has high absorptive powers, which means that it draws other elements into itself. When it is exposed to contaminants, toxins, and impurities, they literally become trapped in the carbon's pores. Activated charcoal has antibacterial properties and it also lends the soap it's beautiful dark color. I then added antioxidant-rich Green Tea to fight free radical damage and add to the anti-aging properties. Green Tea has been shown to make your skin look brighter and flawless. Acai berry was also steeped into this tea. One of the main skin benefits of acai berries is the antioxidants (more anti-aging properties) and it's rich in vitamins A, B, C, and E so it revives skin, heals damaged skin cells, and restores moisture. Of course, our antioxidant rich Grapefruit Seed Extract is included and then to top it all off I added Essential Oils of Peppermint, Lemongrass, Tangerine, Lavender, and Tea Tree which are all very beneficial for having blemish-free, flawless skin and also gives the soap it's lovely fresh scent! Apple Sage: Refreshingly sweet, juicy apple and herbaceous sage with just a hint of pineapple, coconut water, and a rich, earthy base. This goat's milk soap is sweet, fresh and mouthwatering! It features a lovely natural color from French Green clay which adds wonderful benefits for your skin. French Green clay gently exfoliates, cleanses, detoxifies, minimizes pores, clarifies, and heals the skin. Also contains coconut oil, sustainable palm oil, olive oil, naturally saponified fats, and grapefruit seed extract. Spiced Coffee: 100% natural; contains olive oil, coconut oil, sustainable palm oil, goat milk, naturally saponified fats, grapefruit seed extract, ground coffee, cinnamon, clove, ginger, and essential oils of lemongrass, orange, and clove. This is a moisturizing bar with a light, fresh scent that provides a lot of exfoliation and deodorizing...great for cleaning up after dirty and/or stinky jobs. Also a popular choice for refreshing tired feet after a long day. 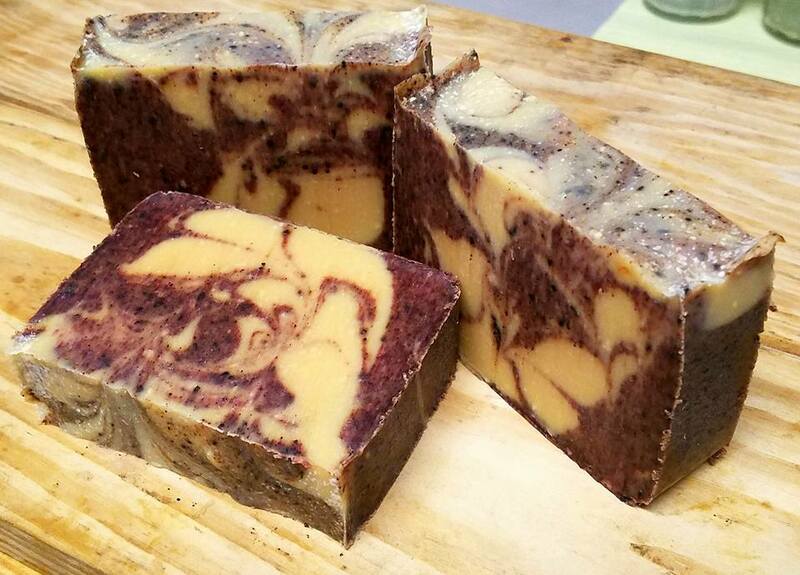 Oatmeal Stout: This is a lovely beer soap that lathers beautifully and is unbelievably moisturizing. Along with the natural scents coming through from the Golden Ale used in the soap, there is also a positively yummy full bodied and smooth fragrance of creamy oatmeal, orange peel, butterscotch, farm-fresh milk, nutty almond and rich vanilla. Also contains olive oil, coconut oil, sustainable palm oil, natural saponified fats, and grapefruit seed extract. Lavender Lemongrass: This 100% natural soap has a lovely light scent from essential oils of Lavender and Lemongrass that is soothing and relaxing. Both Lavender and Lemongrass essential oils have a plethora of skin benefits. I also added brazilian clay to help improve circulation, gently exfoliate, cleanse, detoxify, and minimize pores, without drying the skin. It also has Indigo powder swirled in which has been used to treat inflammatory skin disorders such as psoriasis and has anti-inflammatory, antibacterial, and anti-fungal effects on the skin. Also contains olive oil, coconut oil, sustainable palm oil, natural saponified fats, and grapefruit seed extract. Christmas Tree: This seasonal goat milk soap is a popular choice around the holidays with it's festive look and scent of Christmas trees, mistletoe berries and Christmas spices. Also contains coconut oil, sustainable palm oil, olive oil, goat milk, naturally saponified fats, oxides, grapefruit seed extract, and a sprinkle of holiday cheer (glitter). Rustic Woods and Rum: Another wonderful beer soap with a warm, smokey, deep scent including rich notes of hay, sandalwood, cinnamon, white citrus and ginger with a base of rum, birch and tobacco. Also contains olive oil, coconut oil, sustainable palm oil, natural saponified fats, and grapefruit seed extract. Orange Spice: This soap is made with a deliciously spicy Mandarin Orange Spice Herbal Tea steeped in warm goat milk embracing the essence of an oriental paradise. Tea benefits can be read in the introduction above. The fragrance of luscious oranges mingles with piquant cloves and cinnamon to create an exotic and mouthwatering scent. Brazilian clay is included which helps improve circulation, gently exfoliates, cleanses, detoxifies, and minimizes pores, without drying the skin. In addition to the fragrance and clay, this soap also contains olive oil, coconut oil, sustainable palm oil, naturally saponified fats, and grapefruit seed extract. Black Raspberry Vanilla: A fresh raspberry and black berry scent, mixed with notes of Italian bergamot, California Barlett pear and softened with touches of plum wine, vanilla orchid and silky cashmere musk. It is a sweet, silky, mouthwatering soap with gorgeous swirls of natural colors using Brazilian clay and Indigo powder which also add wonderful benefits for your skin. Brazilian clay helps improve circulation, gently exfoliates, cleanses, detoxifies, and minimizes pores, without drying the skin. Indigo has been used to treat inflammatory skin disorders such as psoriasis. It has anti-inflammatory, antibacterial, and anti-fungal effects on skin. In addition to the fragrance, goat milk, clay and Indigo, this soap also contains coconut oil, olive oil, sustainable palm oil, naturally saponified fats, and grapefruit seed extract. Bastille: 100% natural and fragrance-free goat milk soap made with a high percentage of olive oil and no additives, making it a very mild, hypo-allergenic soap that is wonderfully gentle on skin. Contains olive oil, a small amount of coconut oil to add lather, naturally saponified fats, goat milk, and grapefruit seed extract. Lilac Garden: Smells just like a garden full of freshly blooming lilacs, made with coconut oil, sustainable palm oil, olive oil, goat milk, naturally saponified fats, fragrance, and grapefruit seed extract. Also contains Brazilian clay which helps improve circulation, gently exfoliates, cleanses, detoxifies, and minimizes pores, without drying the skin. This soap is luxuriously creamy and leaves skin feeling so pampered! Hogwarts: Tart cranberry and apple, warm cinnamon, spicy clove, and hints of fir, pine, and mistletoe. In addition to the fragrance, it contains coconut oil, sustainable palm oil, olive oil, goat milk, naturally saponified fats, oxides, micas, and grapefruit seed extract. Gryffindor: A spicy blend of cinnamon, clove, apple and the warm glow of crackling warm firewood with a hint of sweet raspberry and vanilla. In addition to the fragrance, it contains coconut oil, sustainable palm oil, olive oil, goat milk, naturally saponified fats, oxides, micas, and grapefruit seed extract. Ravenclaw: A lovely blend of lavender, lemongrass, and zesty green tea with a hint of sage and basil. In addition to the fragrance, it contains coconut oil, sustainable palm oil, olive oil, goat milk, naturally saponified fats, oxides, micas, and grapefruit seed extract. Slytherin: A refreshing blend of black tea with fruit and spice and a hint of tobacco and salty driftwood. In addition to the fragrance, it contains coconut oil, sustainable palm oil, olive oil, goat milk, naturally saponified fats, oxides, micas, and grapefruit seed extract. Hufflepuff: A scrumptious blend of toasted almonds, sweet cakes, creamy oatmeal, butterscotch, rich vanilla and a hint of drizzled chocolate and orange peel. In addition to the fragrance, it contains coconut oil, sustainable palm oil, olive oil, goat milk, naturally saponified fats, oxides, activated charcoal, and grapefruit seed extract. Forbidden Forest: A rich, deep blend of Siberian Fir, White Pine, Clove buds, and Mistletoe with just a hint of fruit and florals. In addition to the fragrance, it contains coconut oil, sustainable palm oil, olive oil, goat milk, naturally saponified fats, oxides, activated charcoal, and grapefruit seed extract. The Three Broomsticks: Simply the mouth-watering smell of Butterbeer. In addition to the fragrance, it contains coconut oil, sustainable palm oil, olive oil, goat milk, naturally saponified fats, cocoa powder, and grapefruit seed extract. Hagrid’s Hut: A rich and intriguing blend of falling leaves, fresh citrus, fireside warmth, indonesian teakwook, patchouli, and amber. In addition to the fragrance, it contains coconut oil, sustainable palm oil, olive oil, goat milk, naturally saponified fats, micas, and grapefruit seed extract. 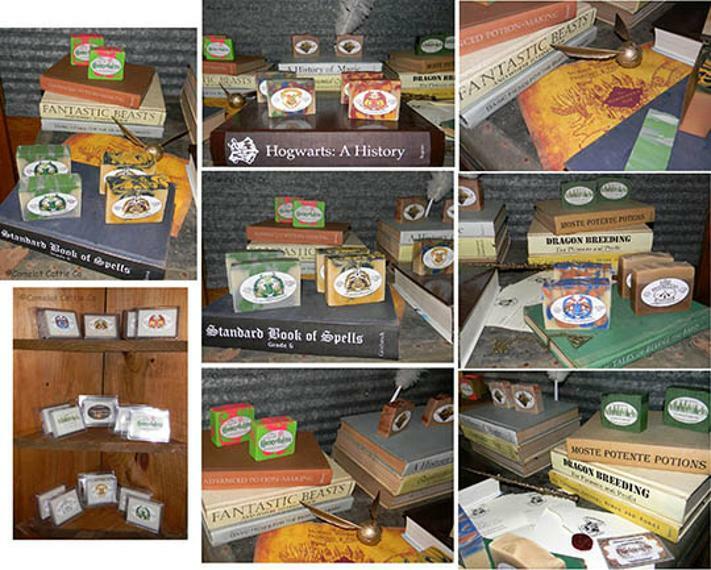 Honeydukes: Sweet, rich cherrywood, raspberry, vanilla, orange, green apple, peppermint, cloves, and a hint of tobacco. In addition to the fragrance, it contains coconut oil, sustainable palm oil, olive oil, goat milk, naturally saponified fats, micas, and grapefruit seed extract. *Note: fragrance melts are scented the same as the soaps and are made with pure soy wax. We use only the finest quality oils, nut butters, and natural beeswax in our lip balms. We use no preservatives, artificial flavors, artificial colors, or cheap fillers. Every ingredient in our lip balm is included because it contributes to the natural, healthy benefits. The butters and oils we use in our lip balms also provide some natural spf. Mint To Bee Lip Balm: If you like Burt’s Bees lip balm, you’ll love our Mint To Bee lip balm! Our Mint To Bee lip balm is very like the original Burt’s Bees before they started cutting corners on quality ingredients and using low quality fillers like soybean oil and canola oil. The natural vitamins (A and E) found in shea butter fight blemishes, wrinkles, bites, burns, sun damage and free radicals. Shea butter contains the same moisturizing properties produced by your sebaceous glands so your body knows exactly what to do with this type of moisturizer! Coconut oil is packed with triglycerides that help smooth the skin and retain moisture. Beeswax creates a natural moisture locking barrier on the skin, keeping moisture in and toxins out while still allowing skin to breathe! Beeswax is also used for its anti-inflammatory and antibacterial properties. Peppermint essential oil contains Omega-3 fatty acids, iron, magnesium, calcium, Vitamins A and C, minerals, potassium, manganese and copper. Peppermint essential oil also contains menthol which gives the lip balm a refreshing cooling effect. Cocoa Kiss Lip Balm: Cocoa butter is a wonderful, natural moisturizer that is high in fatty acids which penetrates the skin for deep hydration. Cocoa butter is rich in antioxidants and the fatty acids will provide a layer of protection from skin stressors and free radicals. This helps to slow to process of aging while acting as a mild sunscreen. Cocoa butter is also known to slow the development of wrinkles, lighten age spots, even skin tone, and reduce scars. It is a natural healer for those with sensitive skin or skin irritations and gives the lip balm it's soft chocolate smell. Coconut oil is packed with triglycerides that help smooth the skin and retain moisture. Beeswax creates a natural moisture locking barrier on the skin, keeping moisture in and toxins out while still allowing skin to breathe! Beeswax is also used for its anti-inflammatory and antibacterial properties. This balm is a nice, mild option with wonderful moisturizing properties making your lips kissably soft! *Everything listed below is by custom order. We may occasionally have them available in the store but if you are wanting certain bath salts/shower scrubs or body butters that aren't currently in the store, let us know. Relax in a bath with our wonderful, health-filled bath salts that include a fantastic blend of magnesium-rich Epsom salts, pure dendritic salt, and baking soda for detoxifying power and soothing relief. Various skin-loving Essential Oils make up each of our different bath salts offered. Our bath salts are 100% natural with no preservatives, whiteners, or other artificial ingredients. Some of the options we have are Peppermint, Lavender, Lavender Lemongrass, Breathe (blend of Peppermint and Eucalyptus), Fresh & Clean (blend of Lavender, Lemon, and Rosemary), Relax & Revitalize (blend of Orange and Lavender), and Clarify (blend of Lemon and Rosemary). If none of those catch your fancy, we can custom mix bath salts to order if there is a specific essential oil or essential oil blend desired (provided I have the desired oils in stock). Our bath salts can also be mixed with an oil such as olive oil or grapeseed oil to be used as a luxurious, exfoliating scrub which can be used for those who may not have time for a bath. Silky Shea: 100% Natural and Fragrance-Free. This is our best selling body butter! Silky Shea is a very luxurious blend I formulated specifically for babies with eczema and other skin irritations but it can certainly be used for adults as well. Silky Shea is a simple blend of Shea Butter and Coconut Oil making it mild, very moisturizing, nutrient-rich, antimicrobial, antibacterial, antioxidant, and anti-inflammatory. Shea butter is known as a miracle cream helping to heal eczema, burns, sores, scars, dermatitis, psoriasis, dandruff, stretch marks, and even diminish wrinkles. This would also be a great choice for conditioning dry hair/scalps and split ends. Because of the large amount of Shea Butter, this body butter doesn't melt into your skin right away like our other body butters. It penetrates and locks moisture into your skin and acts as a barrier on your skin. Peppermint Cocoa: 100% Natural. Pamper your skin with this divine blend of cocoa butter, coconut oil, and Peppermint Essential Oil. Cocoa butter is a wonderful, natural moisturizer that is high in fatty acids which penetrates the skin for deep hydration. Cocoa butter is rich in antioxidants and the fatty acids actually are a benefit to your skin, because they will provide a layer of protection from skin stressors and free radicals. This helps to slow to process of aging while acting as a mild sunscreen. Your skin will look healthier from day one. Cocoa butter is also known to slow the development of wrinkles, making it a great anti-aging ingredient, as well as reducing stretch marks. The previously mentioned antioxidants also work to lighten age spots, to even skin tone, and to reduce scars. It is a natural healer for those with sensitive skin or skin irritations such as eczema and dermatitis. Spiced Mocha: 100% Natural. Lavish your skin with this absolutely decadent, luxurious blend of coffee butter, cocoa butter, coconut oil, and Essential Oils of Orange and Clove. Not only does this smell delicious but it is absolutely rich in skin-loving properties. Both Coffee butter and Cocoa Butter are highly moisturizing, help to soothe and repair irritated, red and dry skin, and help to protect the skin from harsh weather. More of the properties of Cocoa Butter can be seen in above in the description of Peppermint Cocoa. Coffee Butter also has anti-aging properties. It is rich in Chlorogenic Acid which is a powerful anti-oxidant that provides free radical scavenging properties. The phytosterol content of Coffee Butter also gives it anti-inflammatory action which can ease skin redness or swelling. This body butter pairs very well with our Orange Spice soap.